This WebQuest allows students to persuade others that one colonial region was better than the other two. Students will do research on their colonial region and then will create a travel brochure to convince others why their's is the best. Imagine that you could time travel back to Colonial times. When the first Europeans traveled overseas to the New World. 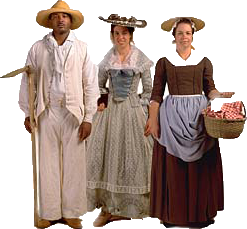 How were the lives of people living in colonial times different from our lives today? Grab your passport because you are about to go on a journey to back to the 1600's, to Colonial America!